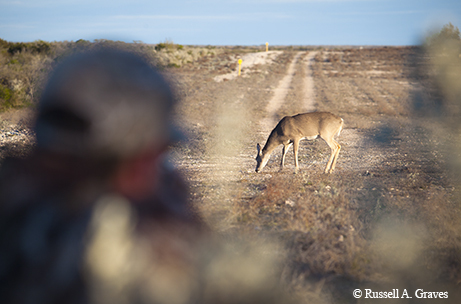 Successful wildlife management results in plentiful deer on the Rolling Plains. Even before the sun rises, I see deer stirring in the creek bottom to the east. For perhaps 15 miles, that skinny creek winds its way through the rugged redlands, on its way to spilling mineral-rich water into the Pease River, creating prime white-tailed deer habitat. Observing deer and thinking about how they’re thriving helps pass the time in a blind that’s just beyond the reach of modern civilization. From my perch, only a single house is visible, and poor cellphone service is a happy inconvenience. If I’d hunted this spot 20 years ago, I might not have seen a whitetail all day. More than three decades of concerted and coordinated wildlife management efforts set the stage for one of the most robust and celebrated wildlife management success stories — the expansion of white-tailed deer populations in parts of Texas where historically they’ve been scant. 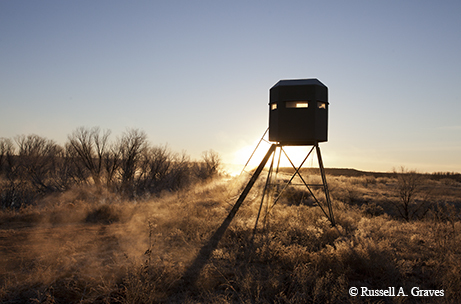 A deer blind overlooks the Texas Rolling Plains. That value incentivizes landowners, who now manage rangeland plant communities to produce whitetails and other game species, Bryan says. The deer populations responded favorably to changing management practices and land use patterns, and now areas west of the 100th meridian have become whitetail hot spots for hunters looking for immense tracts of largely unspoiled wilderness. Consider the numbers: According to Texas Parks and Wildlife Department population estimates, density numbers increased in the Rolling Plains from 13.39 deer per thousand acres in 2005 to 21.04 deer per thousand acres in 2015. Densities were even higher in 2009-2010 before drought took a toll on whitetail numbers; trend lines show that their numbers are rebounding again. By comparison, when TPWD released a final batch of deer in Hardeman County in 1991, wrapping up a stocking effort that began in 1939 and resulted in the release of 3,170 deer in the Rolling Plains, density numbers across the region were about five deer per thousand acres. Early records of white-tailed deer in the region suggest their distribution was very limited. Now, Rolling Plains densities are comparable to most every other part of the state where whitetails are common (except for the Edwards Plateau, where densities are much higher). The Rolling Plains has historically had an agrarian-based economy, and there was a time when most landowners couldn’t fathom a robust hunting economy. Just a generation ago, West Texas had few white-tailed deer, save for major creek and river drainages in the area. Desert mule deer, made for big, wide-open country like the mesquite and prickly pear rangelands of the Texas Rolling Plains, were the dominant cervid species. This more physically robust cousin to the whitetail uses its ability to dash away in the face of danger, covering the rough and rocky terrain of this area in a hurry. As land use practices changed and much of the highly erodible cropland was placed in the federally subsidized Conservation Reserve Program, more cover was created for wildlife species like white-tailed deer. While mule deer are a bit more fickle about where they live, whitetails are master adapters and thrive in a wide range of habitats. Across the Rolling Plains, ranchers are creating water oases that increase plant diversity by capturing rainfall runoff in the pasture, allowing it to soak in instead of run off. Landowners minimize livestock grazing in riparian (streamside) areas and use prescribed fires to stimulate warm-season grass growth and forb growth. The end result of these efforts? 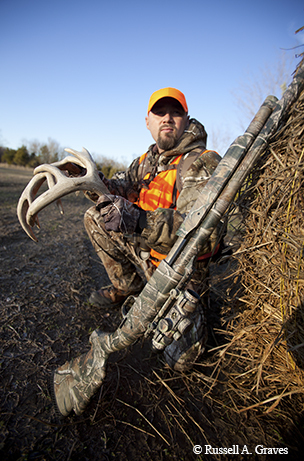 Bryan says fawn survival is high and the overall body condition of animals is healthier. In short, they’ve created a perfect mix of ingredients to sustain and grow white-tailed deer herds in the Texas Rolling Plains. Though nearly nonexistent in Texas (except for isolated pockets) a century ago because of overhunting, whitetails are found across Texas now, reaching a population of nearly 4 million. That number remains stable due to sensible county-by-county harvest regulations, helping the state avoid major population swings. 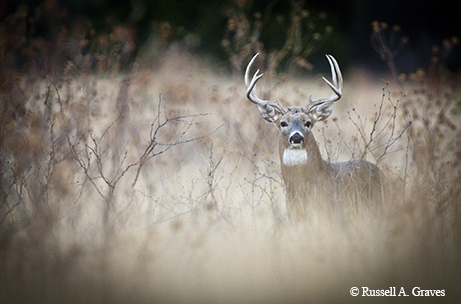 The whitetail’s ability to adapt to a variety of food sources and high propensity for reproduction, coupled with careful management practices, ensure abundant populations of Texas’ most economically important wildlife species, even in places where they barely existed a quarter-century ago. In turn, the whitetail’s proliferation has economically bolstered locales that endure the boom-and-bust economies of the oil and agriculture industries. White-tailed deer, to some extent, provide some stability to areas whose local economies are marginal at best. Childress is a frontier town of sorts. While U.S. Highway 287’s busy ribbon of blacktop brings more than 20,000 cars a day through the community, the town itself sits a long way from anywhere. Pick a direction and it’s at least 100 miles to bigger Texas burgs like Lubbock, Amarillo or Wichita Falls. Isolation, however, is part of the puzzle that bolsters Childress’ prospects for economic survival. A smattering of restaurants, retail establishments and various service-related industries give the town a good mix of business that creates a bit of economic gravity and pulls in people from a larger geographic area in which to trade. In all, it’s a blessed mix of isolation and varied commerce that makes the local economy tick. While the town is removed from any semblance of an oil industry, agriculture commodity prices do affect the economy. The town, however, surges on. In between waiting on a steady stream of customers who shop for everything from paint to plumbing supplies in his hardware store, John Lott walks over to an area he’s recently dedicated to hunting gear and restocks the area. Even early in the day and at a time of year that seems illogical (late May) to sell hunting supplies, customers have already picked through the items. In the past decade, hunting products that were once somewhat of a novelty item on western Texas store shelves have become staples. White-tailed deer hunting has created a cottage industry for retailers who carry durable goods like elevated blinds and feeders. Deer corn sales at key times of the year like Labor Day often reach frenzied levels as hunters buy full pallets. Each pallet is stacked with a (literal) ton of feed and is subsequently dispensed on land that’s either owned or leased by hunters. In all, somewhere in the neighborhood of a half-billion pounds of corn is sold to hunters in Texas each year. Lott, who also serves as a board member for the Childress Economic Development Corporation, sees benefit in catering to hunters who have embraced the Texas Rolling Plains as a viable deer-hunting destination. The vast Rolling Plains rangelands make up a big part of North Texas. Lott confides that while he sees a direct benefit from the area’s de facto tourist attraction, economic activity related to hunting readily spills over into other segments of the local economy. The draw from this new recreation, he explains, also affects sales at almost every other retail business or service in town. All told, Texas deer hunters spend in excess of $350 million on equipment annually in pursuit of their game. While short-term income generated through the deer hunting industry is substantial and important, it underscores the ability of a natural resource to build real and lasting wealth in a community. Oil and natural gas production affected some areas of the Rolling Plains, but the shale plays were sporadic, and many areas never benefited from the early-century boom that pumped trillions into the Texas economy. The free flow of money did affect another tangible segment of the rural Texas economy: land prices. According to the Real Estate Center at Texas A&M University, Rolling Plains real estate values were virtually stagnant over a 30-year period from 1971 to 2001. When deer populations reached a critical mass in the early part of the century and Rolling Plains rangelands provided both quantity and quality white-tailed deer, hunters took notice and began buying up rangelands at an unprecedented pace. From 2003 to 2007, while the size of the average tract traded over a broad area that lies along the 100th meridian remained relatively unchanged, the value of the land per acre doubled. The change was almost single-handedly driven by an interest in using the land for its recreational components. A hunter uses antlers to rattle up bucks in a hay field. Like other hunters who chase deer around here, we hunt whitetails in a way that can be pretty formulaic. Acres upon acres of similarly arranged landscapes make deer movements hard to track; thick brush and tall grasslands make them hard to see. Deer movement can be influenced, however, with smart placement of feeders. I put a corn-filled feeder on a ridge between two draws. Each morning, deer filter in from the draws, eat a bit of corn and move on. From my blind that’s 75 yards away, my kids and I can monitor whatever comes to feed. It’s a typical yet effective setup. To my right, my 12-year-old son’s been watching some wild hogs root for corn around the feeder. He’s entertained by their antics — so much so that he doesn’t see a mature six-point buck that’s slipping toward the feeder from the south. Deer hunting is a rural rite of passage for boys like Ryan. He’s a rugged little man who loves to go hunting, but he’s yet to harvest a buck. Twenty years ago, the chance that’s before him would have been impossible. Ryan and I would have had to pack our things and head to a lease in the Hill Country, like so many others. Now, thanks to careful management and common-sense game regulations, Ryan may harvest a deer only a few miles from where he lays his head at night.